Bartek Ciszewski: What is Apps for Good about? Ruairí Doyle: We are an education tech charity based in London. We work across the UK and recently have spread to other countries. We work with schools to develop digital skills. We offer them a free app development course. The students learn idea generation, problem solving, teamwork, market research, business planning, and programming. When they have their app ready, they enter a competition, where winners get a professional agency to develop their products. Our courses are available to teachers online through our platform. This is where we needed Netguru's help – to revamp our core software. Bartek: What were the challenges? Ruairí: The platform was originally built in 2012 and was later developed by different teams. By 2016, it needed a major upgrade. One of the goals was to make it scale up better, since we are expanding to new markets, such as the US, Spain, Portugal, and Poland. The project also included improving the UX, design and app architecture. Bartek: What was the experience working with Netguru? 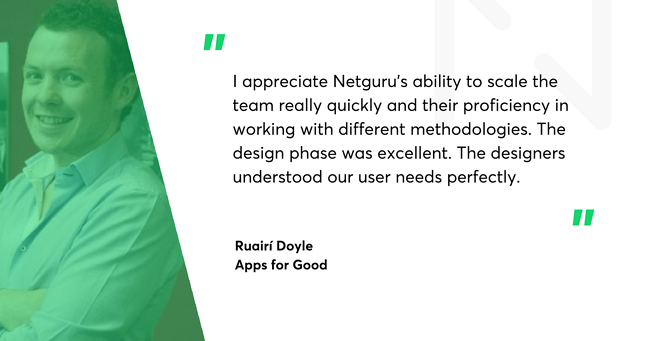 Ruairí: We talked with another agency, but it was Netguru that offered full-stack development services. I appreciate Netguru's ability to scale the team really quickly and their proficiency in working with different methodologies: agile or waterfall. The design phase was excellent. From the start, we applied comprehensive thinking. The designers understood our user needs perfectly. The build phase was very good, too. The developers were skilled and conscientious about the work and the project goals. They were very engaged. To the point that they decided to attend an Apps For Good event that took place in Poland just to understand our product and users better. That's a level of involvement I haven't seen before. Finally, we have a very strong PM on Netguru’s side: Svetlana. She has full control of the project, ensures adherence to deadlines, and manages expectations very well. This is especially important in an outsourced relationship between teams. Netguru has a very open door policy for the client. They make you feel as an integral part of the development team. Some agencies build walls between the client and their team, and disappear for weeks without any contact. Netguru offered constant communication, which was very reassuring. Bartek: How many developers worked for AfG project? Ruairí: Generally, we worked with two to three developers. However, the effort could be scaled up on demand. I remember participating in Google Hangouts with eight to nine people. That's another key benefit of working with Netguru: their scaling model. They move their spare capacity from project to project, and junior developers were brought into our project to speed things up. This is very important for a project with a limited budget. Bartek: How advanced is the project at the moment? Ruairí: We launched the first version of our new platform in mid-August. It was delivered on time and on budget. So far, we have seen fantastic results. We are able to capture what's happening on the platform. We also introduced metrics to help us measure the impact of Apps for Good activity. In the first stage, we were working on the part of the platform dedicated to the educators. At the moment, we are developing the second version for students, and later, we will extend it to the expert community. We are repeating the formula we tried before, with small phases of design, build, and release. Bartek: How did you like working remotely? Ruairí: It was very efficient. We visited Poznań towards the start of the project, which proved to be very useful, and getting to know each other was a great experience. Although we talk everyday on Slack, attend Hangouts stand-ups, having face-to-face contact and seeing the entire team together was one of the best things we could have done. Bartek: Any advice for people thinking about hiring a remote developer team? Ruairí: Take a close look at the technology stack. It should be relevant for the organisation you want to hire. An agency can be fantastic, but their tech stack can be outdated. It's good when the developers and designers have a “user first” approach. I think an agency that can scale your team quickly without fuss should be always higher on your list. Even if you don't plan to expand your team at the moment, it's always good to have such an option. When you manage the project, nurturing the relationship with the remote team members should be one of your priorities. You need to dedicate some time to develop a personal relationship. I think meeting in person once or twice per quarter should be enough. It really pays off.